We warned that the LHINs would be used to implement the same kind of race-to-the-bottom competitive bidding we witnessed in home care on hospitals. The government said we were scaremongering, yet we note that the government now plans to have independent health facilities enter into competitions this year with hospitals to perform such services as cataract surgeries and endoscopies. We are told this is only the beginning. We warned that the LHINs would drive down wages as services got divested to community-based agencies. We should note that the Ontario Hospital Association recently advocated that the Public Sector Labour Relations Transition Act (PSLRTA) not require agencies to pay hospital wages to employees transferred to such community health providers. The LHINs have gotten around such PSLRTA requirements by not publicly stating where hospital services were going after permitting outpatient clinics to close under the auspices of hospital accountability agreements. Every time we are told these services will re-open in the community, but are never told when, where or on what scale. That makes it very difficult to assert workers’ legitimate rights. We warned that the LHINs would help the government rationalize services and require patients to travel further to access care. We have seen this repeatedly in the decision to create so-called centers of excellence even when there was no evidence to suggest lower volumes performed closer to home threatened quality. The Windsor Regional Hospital recently fought—and won – this issue when Cancer Care Ontario tried to defund the hospital to make it stop performing thoracic cancer surgery. Windsor residents didn’t want to travel to London when they could get the surgery done closer to home. Critical to the victory was the absence of any evidence by Cancer Care Ontario that quality or outcomes would differ. You may very well say that most of these decisions really reflect the direction of the Ministry of Health – and you’d be absolutely correct. To create the LHINs the government shut down seven regional Ministry offices and effectively turned around and opened 14 in their place. 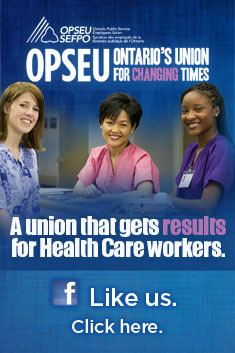 OPSEU members lost more than 2,000 jobs at the Ministry of Health only to see about 500 be newly established at the LHINs. That’s a quarter of the staff to provide oversight to 149 hospital corporations, more than 600 long-term care homes, 14 Community Care Access Centres and hundreds of smaller community-based health providers. That’s a quarter of the staff to do health system planning, a quarter of the staff to provide expertise and to seek public input. Make no mistake – this was doomed to failure. To create the veneer that real decisions were happening locally, the government appointed nine-member boards to each of the regional LHINs when no board existed to oversee provincial decision-making. Where the key provincial decisions take place there is no board. Where these key decisions simply get implemented there is a board. We’re not sure this makes much sense. Anybody who attends a LHIN board meeting will quickly realize that any local decisions are being made by senior staff under direction from the Ministry of Health. So why do we pretend otherwise? This is likely not news to you. That is also our perspective. Our own hope for the LHINs was that the process around system transformation would be an open one and that there would be an opportunity for the public to have meaningful input to the decision-making process. While the definition of integration is clearly spelled out, few of the number of substantive changes to local health delivery get treated with any kind of open process. We’re told there is no integration process if the services transfer outside the scope of the LHIN. We’re told there is no integration process if a health provider transfers services between two of its own sites, even if they are geographically distant from one another. We are told that there is no integration process if the changes are a result of a hospital meeting its accountability agreement. We are told there is no integration process if a health provider independently chooses to close its doors. When you think about it, there are very few opportunities to actually go through the integration process, not that it is particularly rigorous. When we do have an integration process, often the details are so vague it would be near impossible for anyone to reasonably evaluate the merits of the plan. Often we don’t even know why the “integration” is taking place – what is it the LHIN is trying to solve? To give such an example, we were recently asked for input on an integration plan that would bring nurses and/or dietitians from the Port Hope CHC to provide diabetes education and support to patients AND staff at the Northumberland Hills Hospital dialysis unit. We were not told how many CHC staff that represented or what education would be conducted — especially when the hospital had existing Certified Diabetes Educators already doing this work. The plan, which we received in December, was set to be implemented in January. The plan lacked any human resources component, leaving us to wonder how this was supposed to work given OPSEU and ONA held bargaining rights for professional staff on this unit. Nor was it clear who was paying the bill or what this cost. How is any stakeholder to reasonably evaluate such a proposal? We also note that infrastructure planning is not well integrated with the LHIN service planning process. While the province continues to sink billions into new hospital infrastructure, the LHINs have been given the challenge of essentially emptying those buildings of services and patients. We presented a report to the South West LHIN in 2010 suggesting the capacity planning for the two new psychiatric hospitals in London and St. Thomas was both out of date and inadequate to local need. We pointed out that the existing aging facilities were working at capacity and couldn’t understand how the new buildings could open with fewer beds amid an aging and growing population base. What happened? Despite our intervention, the hospitals went ahead as originally planned. The first, St. Joseph’s South West Centre for Forensic Mental Health Care, opened in St. Thomas last year. When we visited a few weeks ago, we were told that all 80 funded beds were full and that patients remained waiting in the region’s crowded corrections centres for lack of capacity. The only provision for the future was nine additional beds, which the Centre could happily fill right now if the funding existed. I should point out that here in Kingston the province is about to make exactly the same mistake with the replacement hospital for Providence Care’s mental health and rehab facilities. What we are presently seeing is not capacity planning, but wishful thinking. Similarly, the Ajax-Pickering Hospital underwent an $80 million expansion that opened in 2010. It increased the overall size of the hospital by 25 per cent. That expansion is now full and the Rouge Valley and The Scarborough Hospitals are proposing another major expansion at the West Durham hospital as part of their merger plan. They feel the space needs to double. They argue an expanded West Durham facility is needed because so many Ajax and Pickering residents travel to Toronto for care in the absence of local capacity. With the new funding formula that follows the patient, that mean health care dollars are also travelling away from the community where services are needed. 1. That the LHINs themselves formally integrate with the Ministry of Health by becoming 14 regional offices responsible for all health care planning, not just the sectors presently identified under LHSIA. These regional offices should also include responsibility for establishing local service and capital planning. The goal of these regional offices should be to place an emphasis on equitable provincial access to quality health care as well as assessing regional need to establish reasonable capacity targets. Expert staff should be available to assist health care providers in resolving performance issues (both quality and financial) and to ensure public accountability. All accountability agreements should be with the Ministry of Health and posted on-line. 2. That an expert panel be appointed by the Ministry in each region to review integration proposals and seek community and stakeholder input, publicly reporting their final recommendation along with the results of their consultations back to the Ministry. The public should have a period of no less than 60 days to respond to an integration proposal. 3. That a process be established for provider integrations, including a template that establishes the purpose of the integration, timelines, cost comparisons, the impact on volumes, quality and access, as well as how the proposed change will impact other health service providers and fit within the regional plan. The proposal should also include a report on the results of public engagement that not only establishes the who, when and where, but a summary of the substance of what was heard. Any proposal should clearly establish whether the recipient of any transfer process is for-profit or not-for-profit, especially in circumstances where the Ministry is establishing a not-for-profit criteria, such has been the promise of the Action Plan around community-based specialty clinics. 4. The integrations process should include any substantive change in service delivery, whether that be a closure, a transfer, a merger or new partnership agreement. 5. Transparency is the best disinfectant. Accountability works best when all business is conducted in public, including posting of the integration proposals and all relevant documentation in a way that is easy to find. 6. We would also strongly recommend that any public disclosure be accompanied by a “popular” summary of the proposal written in plain language. Similarly, the websites should be reviewed to make them more user-friendly. 7. We would urge the government to strengthen accountability agreements to require health service providers to give reasonable notice of closure except under circumstances that may be beyond their control, such as bankruptcy or fire. The Ministry should be able to order such providers to remain open until such time services can be reasonably transferred. 8. The Ministry should undertake an evaluation of staffing needs at these regional offices to ensure that they have the capacity to undertake service and capital planning, accountability, integration and provider support. Ultimate accountability should reside with the elected representatives, including the Minister of Health. This entry was posted in Local Health Integration Networks and tagged Donna Cansfield, LHINs, PSLRTA, Public Sector Labour Relations Transition Act, Standing Committee on Social Policy, Warren "Smokey" Thomas. Bookmark the permalink.